James Fox and Nancy Bush feel a dual connection to nature. 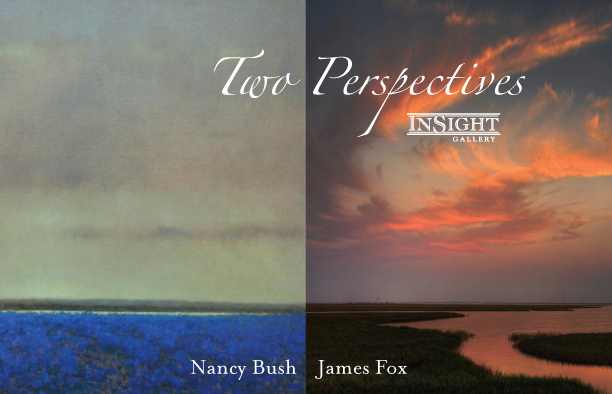 Using two very different mediums, photography and tonalist oil painting, both Fox and Bush capture the very distinct mood of a place in their artistic journey entitled Two Perspectives, Crossing Paths and InSight Gallery, 214 West Main Street. The concept of this show centers around perspective – two states, four seasons, a shared location, two different points of view. How does one place affect two different people? Nancy and Jim hope to illustrate just that. Locals in both Texas and New Mexico, they have chosen several of their favorite landscapes throughout these states and use their own artistic medium to convey the light, mood and atmosphere of that particular place. The end result is the beauty of interpretation through contrasting perspectives. This will most certainly be a dynamic collaboration. This show will be exhibited at the Rockwell Museum of Western Art in Corning, New York – January through May 2012.